Biggest Challenge In 2016: …but there were also plenty of uninspired, head-scratching stretches where Yale, admittedly a fairly young team except for its QB, really laid eggs. Not scoring an offensive touchdown against Columbia in a 17-7 defeat is not something Ivy League champions do. Neither is yielding 592 yards of offense to Dartmouth in a 35-3 spanking, no matter how many starters were injured. Can Reno have his team avoid these lapses this season? Biggest Departures: QB Morgan Roberts statistically was one of the best QBs the Eli have ever had. A transfer from Clemson, he concluded his career at Yale as their career leader in passing yards (6,182), total offense (6,494) and completion percentage (.610). Yale will have to rely on a new leader in 2016 to replace him. Players To Watch: All the spring revealed in terms of the new starting QB is that it is still a battle between junior QB Rafe Chapple (the brother of former Harvard QB Colton Chapple) and sophomore QB Tre Moore for the top spot so far. Whomever wins the battle, their development will be closely watched in the early going. One thing that the winner will have going for them is a veteran team around him. 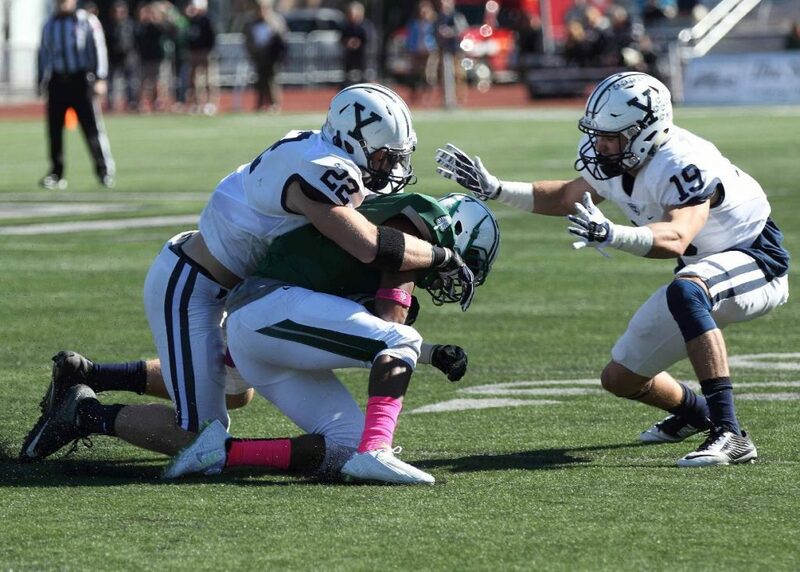 RB Deshawn Salter (561 yards rushing, 7 TDs) figured prominently in some of Yale’s best games in 2015, and the junior from Syracuse, New York could be a very valuable piece of the Bulldog offense. But it’s Yale’s defense, which returns five all-Ivy League selections, that could really take a step in the right direction. DB Matthew Oplinger, one of the better rovers in FCS, had a breakout season last year with 65 tackles and 6 sacks, and should only get better with another year under his belt. Biggest Game: at Harvard, 11/19/2016. They call it “The Game”, but for Yale folks more than ever it is the be-all and end-all of the season because the Eli have lost nine straight to Harvard and are more desperate than ever to end the Crimson’s stranglehold. Last year, as ever, Harvard rolled to a 38-19 victory – and, as ever, Yale’s hopes at an Ivy League title go through Cambridge. Yale In Two Sentences: The Bulldogs going into 2016 are like a cake without leavening. If they find the yeast or baking powder that they need – in the form of a new QB and a few other position players – they could find themselves challenging for some Ivy League title cake.